Explore the club providing childcare and support to working women. Photographed by Jess Isaac for The Jane Club. When working women come back from maternity leave, it's rare for them to receive the real support they need. Inflexible hours, expensive childcare, and a lack of infrastructure to help women balance motherhood and their professional goals is a serious problem in the United States. The Jane Club is hoping to change that. 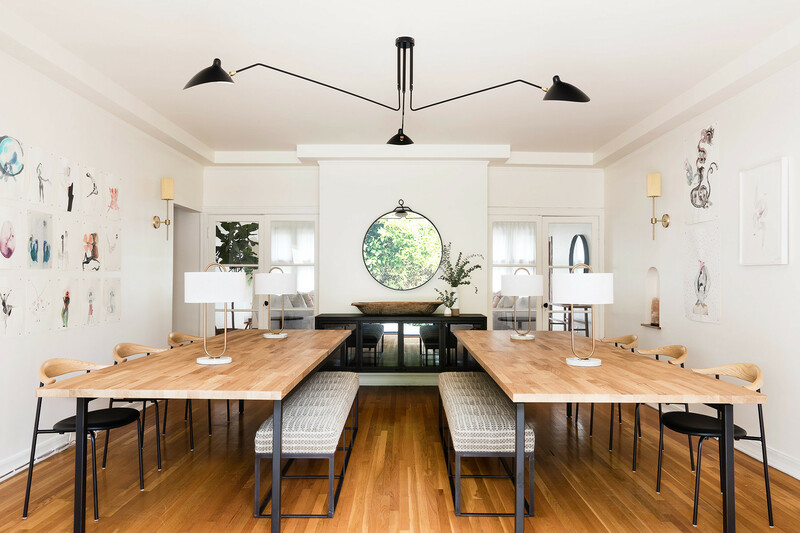 The new co-working space based in L.A. is a gorgeous home that not only provides a warm and beautiful environment for women to get down to business, but also provides childcare and community support for its members. Founded by actress June Diane Raphael and producer Jess Zaino, The Jane Club was created out of a desire for change and community. "Jess and I were both in the same position in our lives, which was we had small children and were entering back into a workforce that was not built or designed for us," shares Raphael. "There’s so much conversation around having it all and doing all the things and not making any sacrifices to just succeed at every level. Yet there’s so little infrastructure to actually support that idea." "Jess and I met at a progressive women’s group that sprung up after the election — I don’t even need to mention what election it was. She told me about this idea that she had for a space where women did not have to apologize for being mothers and women did not have to apologize for having professional careers," she explains. "A place where both things could be helped. That really was the inspiration for the Jane Club. What it comes to is physical space and infrastructure of support so that we could soar professionally and personally." It's no surprise that this amazing idea caught on fast within the local community. With investors like Brooklyn Decker, Tig Notaro, and Kelis, The Jane Club was able to find a home and become a reality. A beautiful space is just one of the amazing resources offered to members. Fashion designer Erin Fetherston was tapped to curate the aesthetic experience. "When we were conceptualizing Jane Club and even before we had an exact address where it would be, I really wanted it from a design perspective to be a home away from home experience," says the designer. "It’s like your best friend’s house. It’s a place where you can relax, let your guard down, and be in that same nurturing type of environment." Co-founder Jess Zaino adds, "When we have guests come in, they have expressed that they take a deep breath — just a sigh of relief — from walking into the house. The accessible beauty of it all is so nurturing for women who have been in the home. It is such a treat and a privilege to have our collective workspace." 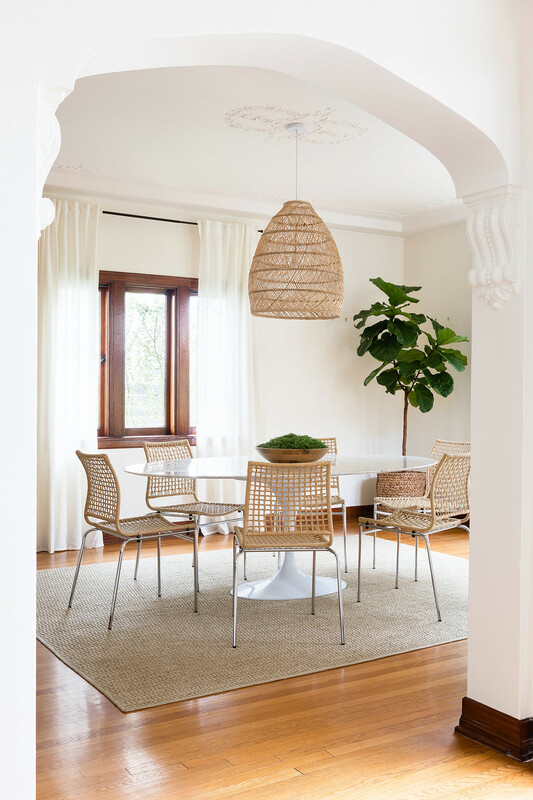 Filled with natural textures, lots of light, and both indoor and outdoor spaces, The Jane Club truly has a dreamy design worth fawning over. "I love the organic modern sensibility blossoming out of the Los Angeles design scene and I also draw influence from the principles of modern Scandinavian design," explains Fetherston. "I aim to maximize natural light and I consider open space as important as furnishings and décor. 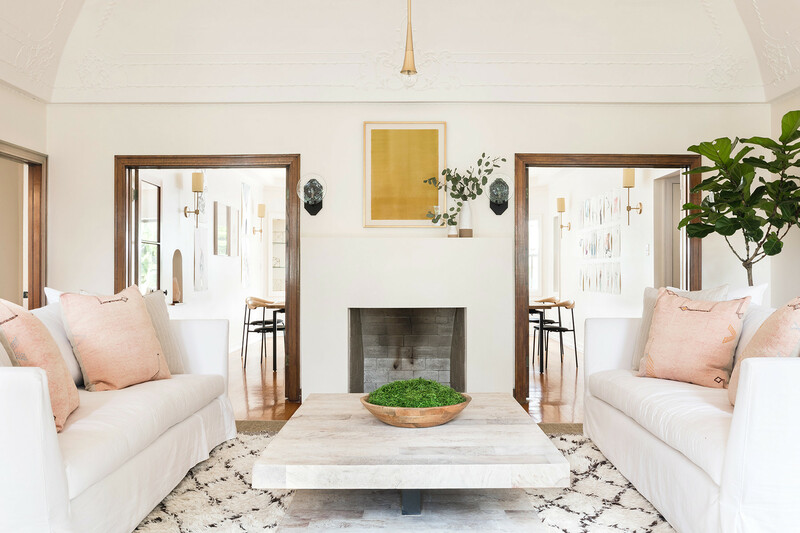 My hope is to create uplifting, warm, and airy spaces that soothe the mind and inspire creativity." The home is divided up into various rooms, each with a different purpose. From communal spaces to more private areas for meetings or quiet work, The Jane Club hopes to provide an environment that adapts to every working mother's needs. "Erin’s design is so important to our space because of what is happening in that space," shares Raphael. "Yes, it is a co-working space and women are getting their work done. But what also happens is because of how comfortable and nurtured they feel from the aesthetics, it creates an intimate connection." Of course, one of the greatest features of The Jane Club is the fact that it provides childcare to its members. The home has an entire section dedicated to a playroom, nursery, and outdoor playground for its youngest visitors. "Possibly my favorite space in the club, the Nest is our children’s area," says Fetherston. "We converted what was originally the house’s driveway into an outdoor playground by laying down astroturf and adding jasmine hedges along the sidewall. A Cedarworks play structure is the main attraction of the play yard." "Inside, I wanted to use neutral colors and natural materials knowing that lots of color would find it’s way into the room through toys," explains the designer. 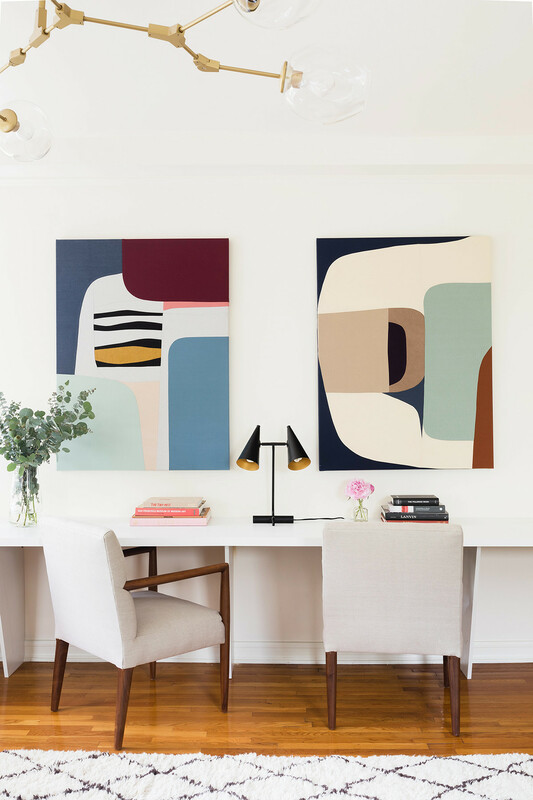 "I love the playfulness of the giant paper lantern pendant that hangs from the ceiling, and the Anne Selke rainbow rug ties everything together." While childcare is offered at The Jane Club, the co-founders made sure to differentiate between the spaces for work and play. "One thing that we’re really passionate about is the children having a separate entrance and space, so that when women are in the Jane Club, they can drop in and see their kids when they want to be with them," adds Raphael. "But they also get that separation that women are craving." Fetherston agrees that this feature is necessary for moms. "I personally have always loved working from home, especially when it comes to creative tasks like design," she shares. "But since becoming a mother, my home has shifted to be a child-centric atmosphere and I find it increasingly more challenging to work there. I think many women experience their work-from-home bubble burst once they have families." "The Jane Club is a remedy for that," continues Fetherston. "It offers the same nurturing environment of a home, but also takes into consideration the real needs of working women. Not to mention the luxury of on-site childcare." The Jane Club is not only providing a space for women to get to work and have their children looked after. It's also looking at motherhood from a holistic standpoint, providing services and events for its members to thrive. "Just last week we did a partnership with Heal," shares Raphael. "They set up in our private Power Jane room and gave our members wellness visits, checkups, and breast exams. After, one member who is an entrepreneur of her own startup told us that she hasn’t had a checkup in six years." "So when we talk about creating infrastructure and a system of support, we do have a workspace and childcare for you," she continues. "But we’re also going to bring in all of the other things and have them done in our space so that you can devote yourself to whatever your heart desires." The Jane Club isn't looking to stop its progress any time soon. "We are opening another club in Los Angeles that is soon to be announced and we are planning on opening two more locations in 2020 on the east side and west side of L.A," shares Raphael. "From there, we know this is not a problem that’s just specific to L.A. and we have the need from women all over the country who want to be spoken to as mothers. We know that this is a national problem and we plan to scale. We are looking at New York, Chicago, and Austin after L.A."
Additionally The Jane Club offers financial support to those who need it. With membership at $350 per month, the founders recognize that it is a privilege to have access to this kind of support. "We have a program called The Jane Legacy Fund," says Raphael. "That is a gifted fund to support legacy members who are doing incredible work and might not be able to afford the membership otherwise." With its amazing resources offered to working women, we can only see good things for The Jane Club in the years to come. "As we grow, when you walk into a Jane Club, we want it to feel like a home," notes Raphael. "We want it to always feel like a soft landing for the women who are returning back to the workplace after their maternity leave."